What Is Design and Decorate? You may question, what is Design And Decorate. You may be thinking of Design and Decorate, your probably thinking about graphic design… well maybe not. But anyway Design and Decorate is a Sims building series the has to deal with interior and exterior design. I’ve came up with series to be able to express my creativity and and design skills and what better way to do than in the Sims itself. 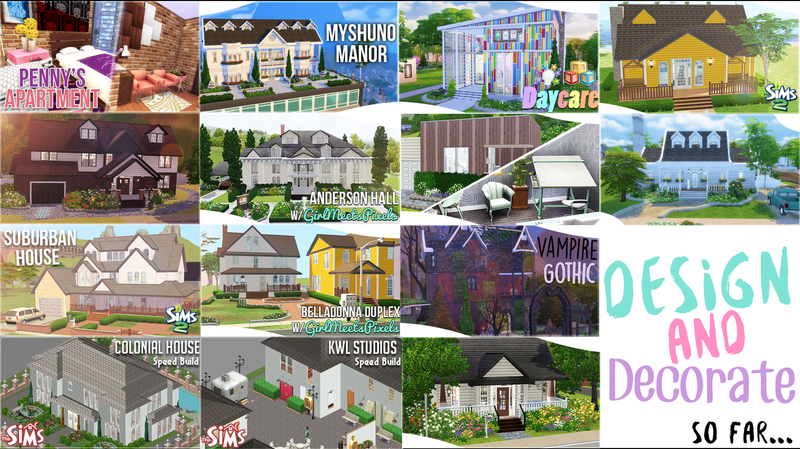 I like to think about that it’s all about building creative houses, community builds, and other type of builds throughout the Sims Franchise that involve different style/themes that people haven’t seen or tried before. Wanna learn more about what Design and Decorate is all about, then be sure to check out the episodes down below by clicking on the picture! If you have any builds you want to see in the series, go ahead and leave a comment below!